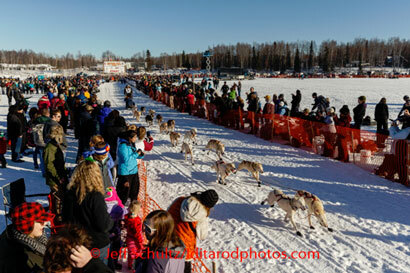 Critical Section - Iditarod day one - and they're off! Iditarod day one - and they're off! And they're off! Today was the "restart" of the 2014 Iditarod, in Willow, Alaska, wherein the real race across Alaska begins. The weather is cold but clear, raising the possibility of icy conditions on the hard and rocky trail which hasn't seen nearly enough snow. As always at this stage of the race there is much discussion between mushers about "strategy"; how hard to run your team early, when to rest, and when to take the mandatory 24-hour break and 8-hour break. 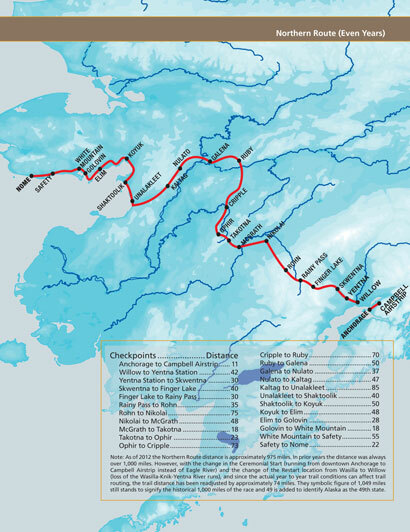 The book move is to go relatively easy until Takotna, which is nominally the halfway point, take a 24-hour break there, then go hard the rest of the way, taking an 8-hour break somewhere along the Yukon river. But some are saying with these hard conditions a faster early push may pay dividends. Another interesting subject for discussion is that some mushers are using sleds with a "caboose", a dog cabin at the back which can hold one or two dogs which are not running. Each team starts with 16 dogs, and there is a lot of strategy about when to "drop" dogs (they are left in the care of vets at checkpoints). When a dog gets tired or just isn't feeling it they might get dropped, but with a caboose they can be carried along for a while before rejoining the team to run with it. This sounds like a good innovation. Another factor is that near the end of the race a larger team takes longer to feed and water. Sometimes having just eight fresh and eager dogs for the final sprint is the way to go.